My Rock Up In Red competition for a chance to win a limited edition Radley London cross-body closes at midnight tonight. Thank you to everyone who's entered so far and in doing so, helped promote The British Heart Foundation and their February 1st Rock Up In Red fundraising event. Thank you also to Radley London for the generous prize. So today's the day to get some red on and send me a picture. 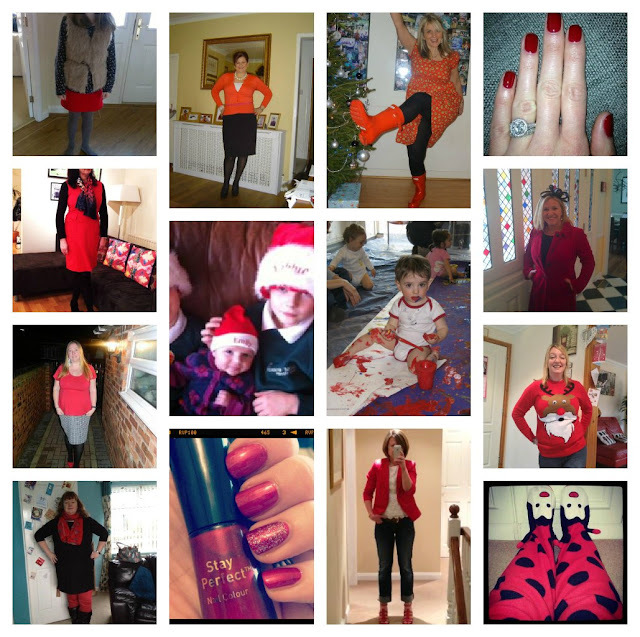 You can email it to schoolgatestyle@yahoo.co.uk, post on the Facebook page or tweet to me @schoolgatestyle, using the hash tag #RockUpInRed. Also check out these other blogs for further chances to win - Avenue 57, Style at Every Age & Does My Bum Look 40. Here's a selection of the entries received so far - loving the creativity and thought that has gone into so many of them. You can check out all the photos in my Facebook album #RockUpInRed Radley Competition. Reminds me I must buy more red, an orangey red is the only one I can do, or the deep wine. A true red doesn't suit my ruddy complexion. That bubby's wee red toes are just too cute!